Built in 1859 on the site of Texas first brewery the Menger ushered in a new era of sophistication to the Texas frontier and more than 150 years of refinements have created a masterpiece of traditional elegance and modern comforts. Many of San Antonios attractions are within a few blocks including the Alamo the famous Riverwalk Tower of the Americas. Rivercenter Mall with its IMAX theater the Henry B. Gonzales conference Center and numerous kid-friendly museums. Menger Hotel is renowned for its beautiful architecture a restored 19th-century wing with Victorian-style guestrooms rare antique furniture and paintings. Stately columns rise from the burnished floor of the lobby and antique furnishings light fixtures and artwork lend an air of historic luxury. 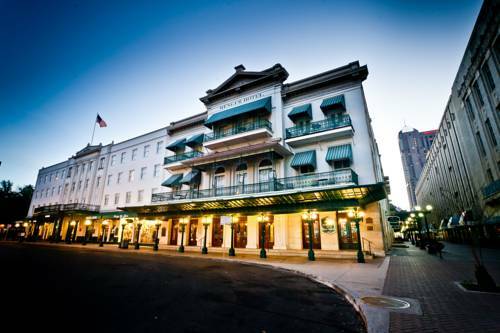 The Menger offers 316 guest rooms including 25 elegant suites. Accommodations feature historic sophistication and modern conveniences. Views include The Alamo Alamo Plaza and the tropical courtyard garden or pool. Guests are lavished with amenities including dining in the neoclassical elegance of the Colonial Room enjoying cocktails and stories in the legendary Menger Bar or relaxing in the large outdoor heated pool in the Spanish garden or at the Alamo Plaza Spa. Located in the heart of downtown next to the Alamo adjacent to River Center Mall across the street from the River walk 2 blocks from the Henry B. Gonzales Convention Center and 8 miles from the San Antonio International Airport. A mission in San Antonio Texas the site of a siege and massacre in 1836 by Mexican forces under Santa Anna of a handful of American rebels fighting for Texan independence from Mexico. Complimentary to enter tours are available for a fee. It is a network of walkways along the banks of the San Antonio River. The River Walk winds and loops under bridges as two parallel sidewalks lined with restaurants bars shops hotels and more. It connects the major tourist draws from the Alamo. Located downtown San Antonio along the banks of the River Walk a beautifully decorated and spacious facility with 1.3 million square feet. Facility include-67 meeting rooms 4 exhibit halls with over 440000 square feet of contiguous exhibit space.